The film picks up just after the events from the prior films, Man of Steel, Batman v Superman and Wonder Woman; a new threat named Steppenwolf—not the 60s Canadian rock band—think alien/demigod wants to destroy Earth. Steppenwolf (voiced by Ciaran Hinds) is a powerful supervillain; he’s searching for three mystical boxes — when combined they will wreak havoc by creating a unstopable force allowing him to dominate the world. Bruce Wayne/Batman (Ben Affleck) recruits aid to stop Steppenwolf as he’s not strong enough on his own. Diana Prince/Wonder Woman (Gal Gadot), is aware of the danger, and agrees that they need more help. Wayne enlists Arthur Curry/Aquaman (Jason Momoa), Barry Allen/The Flash (Ezra Miller) and Victor Stone/Cyborg (Ray Fisher), together they launch the Justice League. Each super hero has their unique idiosyncrasies, their dialogue is enjoyable to view as they provide an up-lift to a series that is known for somewhat of a dark tone. Playing off of each other, adds to their camaraderie, lightening the mood. The best of the bunch has to be ‘hands down’ Barry Allen/The Flash he steals the film as did Spiderman in the Marvel composite film. His actions and nuances are comical; he’s also the most relatable. So why is Clark Kent/Superman in the previews and advertising for Justice League if he’s supposed to be dead? Well, simple, he’s brought back to life with the help of Batman, Aquaman, and The Flash. Speaking of Aquaman, played splendidly by Momoa, the relatively new superhero is from an Atlantean origin, exhibiting a large 6’ 4” presence as the ocean-dwelling super-human with an amphibious nature. His super-powers are numerous including enhanced sight, hearing, smell, superhuman strength, marine telepathy (the ability to communicate directly with sea life), and more. He wears a non-stop scowl through the film as his guise is very serious. He’s a unique and welcomed addition to the group. Victor Stone/Cyborg, (Fisher), garners the most sympathy as his new super condition has his own body parts intermixed with advanced mechanical parts, granting him superhuman strength, speed, stamina, and flight. His internal computer system can also interface with external computers. Fisher’s performance was spot-on, with a wide range of emotions. And what about my favorite superhero Gal Gadot’s Wonder Woman? Her performance is like ‘a breath of fresh air’ just as in her successful film, Wonder Woman, she’s one of the best actresses to ever tap into the superhero role — her presence alone elevates the film with her beauty, strength, compassion, and intelligence. She’s a joy to view in all of her scenes. The score by Danny Elfman’s hits the right notes garnering a feeling of urgency with strong orchestra overtures. You’ll also hear pop songs along with some rock songs; I especially enjoyed the fantastic Gary Clark Jr. & Junkie XL rendition of the Beatles song, Come Together. It was placed appropriately in the film just before the big battle. 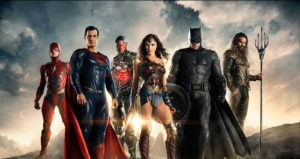 I actually enjoyed Justice League more that I thought I would as the prior films, excluding Wonder Woman have a dark and brooding in tone, this one seemed to be lifted upwards perhaps by the addition of Josh Whedon’s directing and editing during post-production. He stepped in when Zach Snyder left the film due to a family tragedy. It should be noted that it’s been confirmed in interviews that perhaps only 10-15 percent of the film could have been affected. Even so, I still enjoyed the upbeat tone. The Bottom-Line: Ben Affleck as Batman is perfect in my universe; he’s a strong, confident leader for the group, with just the right amount of arrogance as Tony Stark’s Iron Man. There are an abundance of elements to cheer about in the film as it has a lightened tone, which I enjoyed, the production design was solid, and the cast interconnected well together. I’m looking forward to further adventures with this series and these awesome characters.